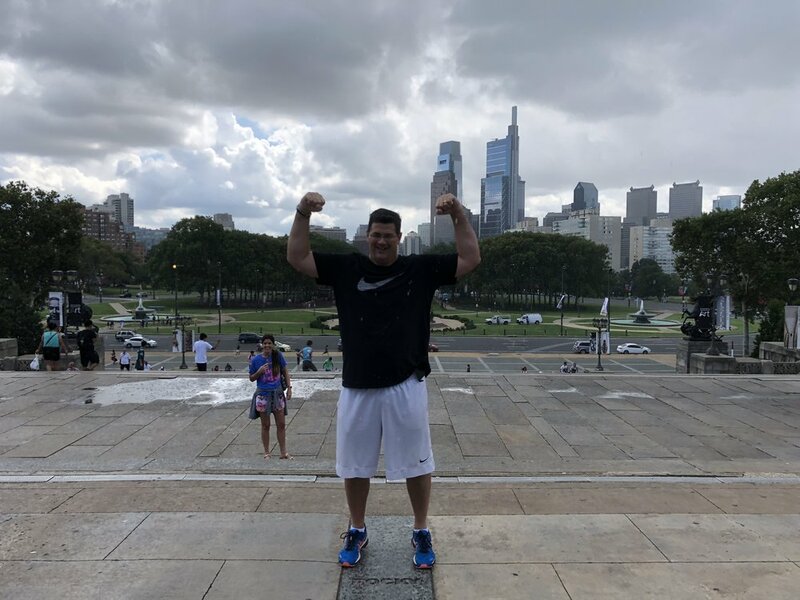 Part 1 - Philadelphia and Atlantic City HERE. Part 2 - Baltimore, Gettysburg, and Harrisburg HERE. Part 3 - East Stroudsburg and the Poconos HERE. We travelled with Mark’s sister, Karen, and her husband, Shannon. They have been to NYC a few times and since we had ONE DAY, we let them choose what all for us to see and do! They did a GREAT job! It was fast and furious and FABULOUS! Day 4 - Here we go! Saturday morning we took our FIRST train ride! Our train left very early from Philadelphia. It was about an hour and a half ride to New York City! We arrived in Grand Central Station! We were at Madison Square Garden. Definitely a must see and a very humbling moment. Since we only had about 12 hours in New York City, we chose not to go to Liberty Island. However, Mark and I want to make sure we go on our next trip! * A fun side note - When I was in the 3rd grade, I composed and performed a song on the piano about the Statue of Liberty and I WON 3rd place in the STATE! Next, we visited the 9/11 Memorial at Ground Zero. Everyone remembers where they were when they heard about the twin towers on 9/11. I was in college at Hardin-Simmons University. We were having the Inauguration of our new University President that day therefore classes were cancelled. I was enjoying a slow morning at home drinking my coffee and watching Good Morning America. They went live after the first tower was hit and then I watched with the rest of the country as the second tower was hit. I have seen the images on TV, read books about what happened that horrific day, and have seen Ground Zero and the memorial sights in photographs. However standing there, at the actual place where the two towers once stood, is something I will never forget. Remembering the lives that were lost and those brave men and women who responded. I do hope to go back and tour the 9/11 Memorial Museum someday. 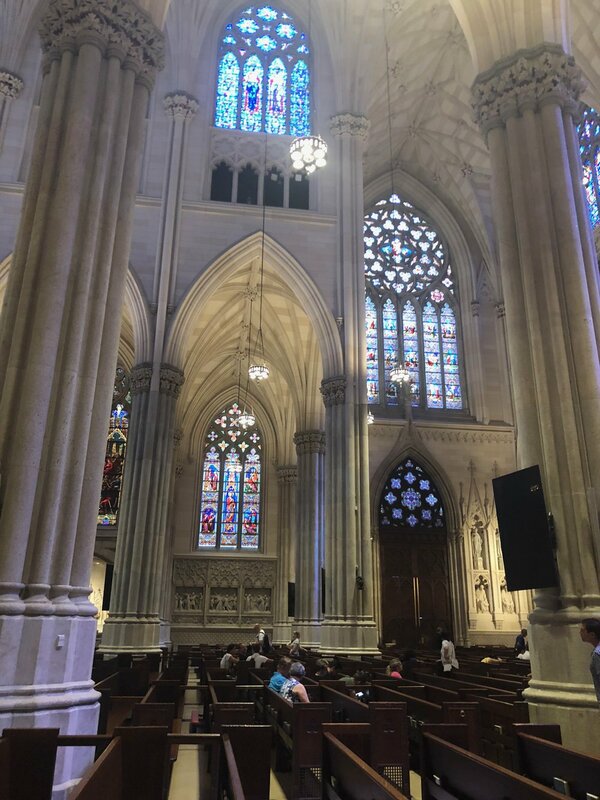 We walked through St. Patrick’s Cathedral and took in the amazing architecture. Absolutely gorgeous stain glass windows! Stunning. I could have sat in there for hours looking at all the intricate details. We walked and walked and walked! Got in all our steps and MORE! So much to see! We were trying our best to take it all in! Mark decided to try a New York City hot dog for lunch. I mean, when in New York, you gotta have the street hot dog, right? We found the Ed Sullivan Theatre! 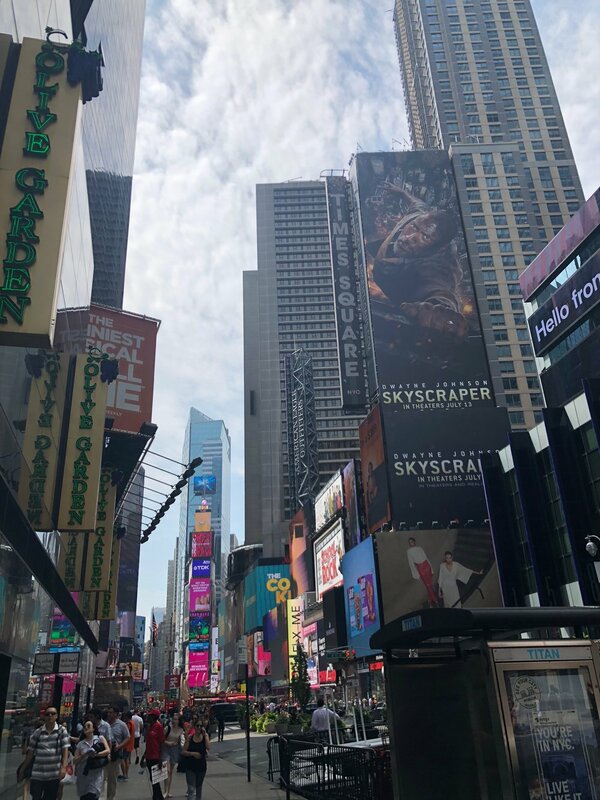 Times Square! Being on Good Morning America is on my bucket list but snapping a picture in front of it would have to do for now! We had tickets to the 2:00pm Broadway show, Waitress, with Katharine McPhee!! We were excited for our first Broadway Show! Mark and I both LOVE musicals! It was SO GOOD! It was funny. It was witty. The singing was AMAZING! When you see your name in lights, you get excited! Ha! Karen had been telling us about this amazing cheesecake from Juniors. After our show, we grabbed a slice. It was FANTASTIC! Gosh, I love a good cheesecake and this one did not disappoint! Mark and I shared a slice on our way to Central Park. It was much bigger than I expected! Speaking of… we found the Friends fountain!! I sent this picture to Alyssa (she’s a Friends fanatic more than her Momma!) and she was just a little bit jealous. I think we’ll have to take a girl’s trip to NYC! We started making our way back to Grand Central Station. We did a little shopping popping into a few stores. Mark bought a new watch at Fossil. I’ve never known someone to collect and love watches like Mark. New watches make him happy! :) Shannon grabbed a few items at the Under Armour store too. When we arrived at Grand Central Station, our train was delayed a few minutes so we grabbed a bite to eat in the train station before boarding. We rode the hour and a half back to Philadelphia, grabbed an Uber back to our hotel, and got to bed around midnight. A few hours of sleep and we were back up at 4:00am to catch our flight home Sunday morning. *Yes, we hit about 5 Starbucks in NYC but I don’t have a picture of any of them. I did buy a mug! If you are new here, I collect coffee mugs when I travel. I’ll have to do a post to update you guys on my new mugs! 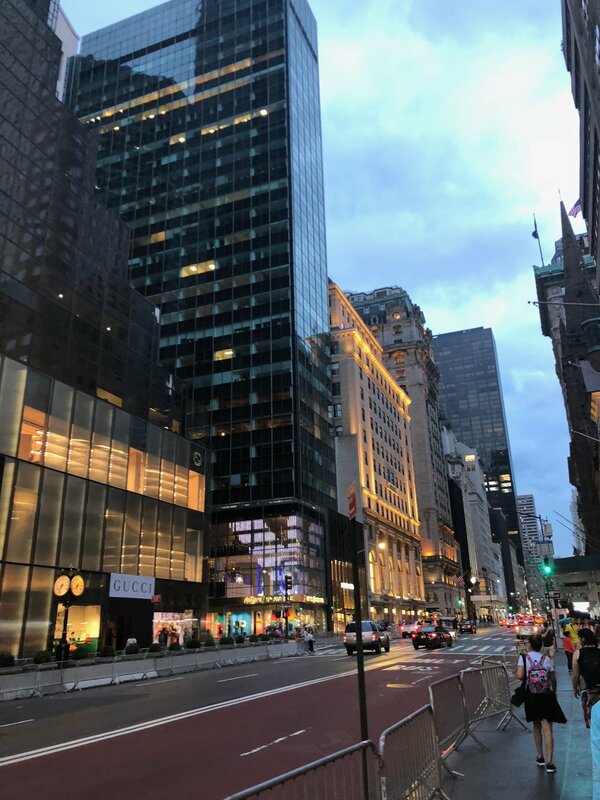 *New York City has a piece of my heart! I LOVED it and am planning a trip back! *If you read all 4 posts, you will see the recurring theme of very little sleep! Ha! This was not a relaxing vacation. It WAS a TON OF FUN! *If you are from or currently live in any of the places we visited, I would love to hear from you! Let me know what we should make sure to see and do next time! I know there was so much more we missed! Thank you for stopping by and sharing in our travels! Last week, I shared Part 1 and Part 2 of our East Coast Adventure trip. 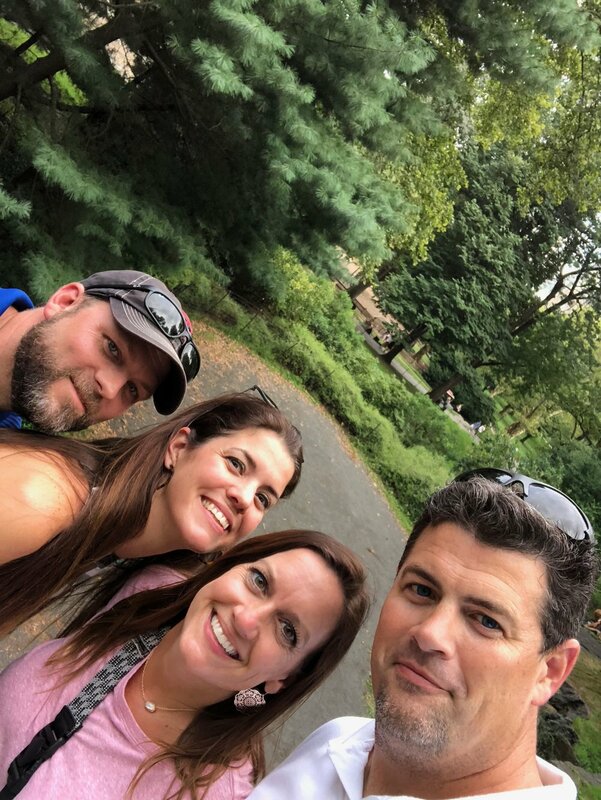 We travelled with Mark’s sister, Karen, and her husband, Shannon and had THE BEST TIME! If you missed those posts, you can read them HERE and HERE. Part 1 had us visiting Philadelphia, PA and Atlantic City, NJ. In Part 2, we travelled to Baltimore, MD, Gettysburg, PA, Harrisburg, PA, and ended our day in East Stroudsburg, PA.
Day 3, we woke up in the Poconos! We stayed at the cutest little Bed and Breakfast, The Cranberry Manor, in East Stroudsburg, PA. It reminded me of the Lorelai’s house in Gilmore Girls! It had a cute little Gazebo in the side yard and this beautiful red barn on the other side of the property. We didn’t spend much time at the B&B but we did enjoy a wonderful breakfast each morning! After our breakfast, we headed to explore Bushkill Falls. 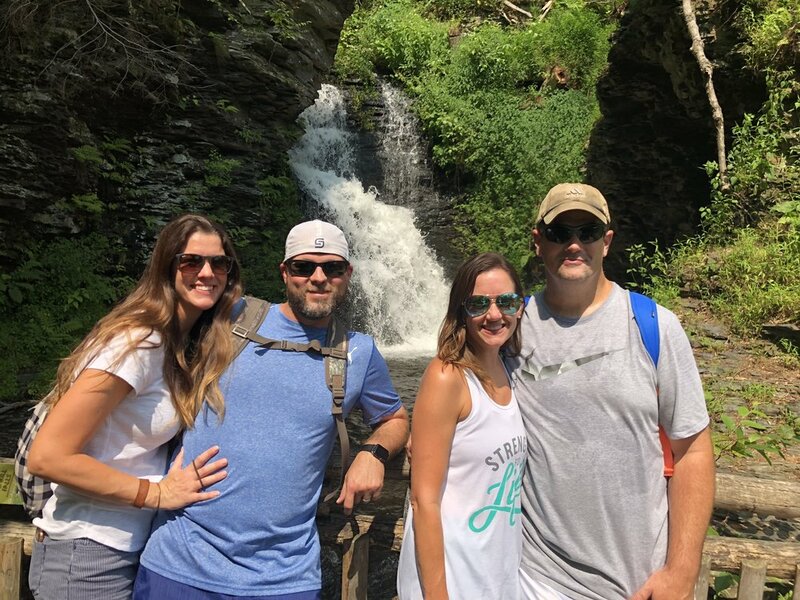 There are several different trails you can choose to hike to see the waterfalls depending on how much time you want to spend there and how much walking/hiking/stairs you want to do. We, of course, decided to do them ALL! Never know if we’ll be back so let’s do it! Friends, this place was amazing! That’s me and Karen on the bridge! The sounds of the waterfalls were so peaceful. We hiked alongside the water for a while at the beginning. It was so beautiful! The weather that morning was perfect! They had a ton of heavy rain come through causing some flooding issues a few days before we arrived. We came across this tree on the trail that had been uprooted by the storms. Seriously, look at those roots!! There were SO MANY stairs! See all those behind Mark? We were working off our breakfast and earning our lunch! Ha! Mark found another fallen tree. One of the last places we hiked was to the top of Bridal Veil Falls. The views were absolutely breathtaking looking out over the mountains. 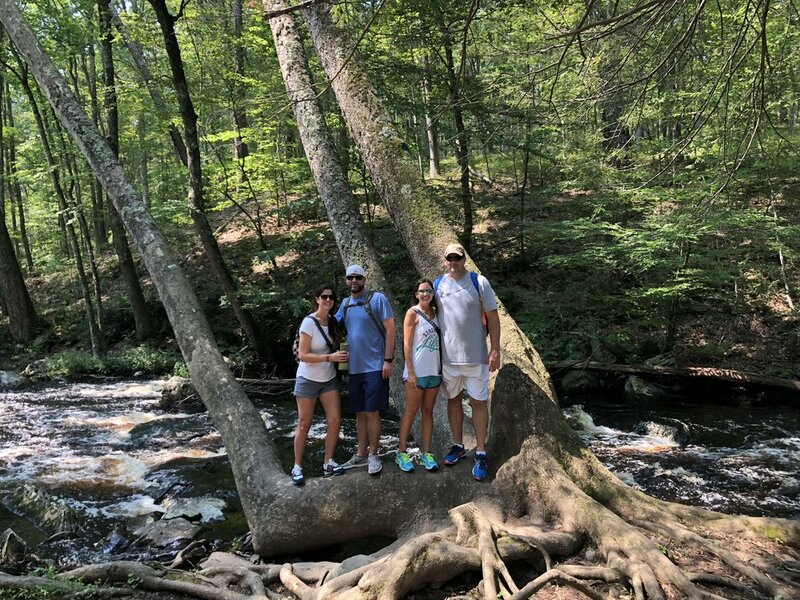 The perfect end to touring Bushkill Falls! If you are ever in the Poconos, I HIGHLY recommend visiting here!! 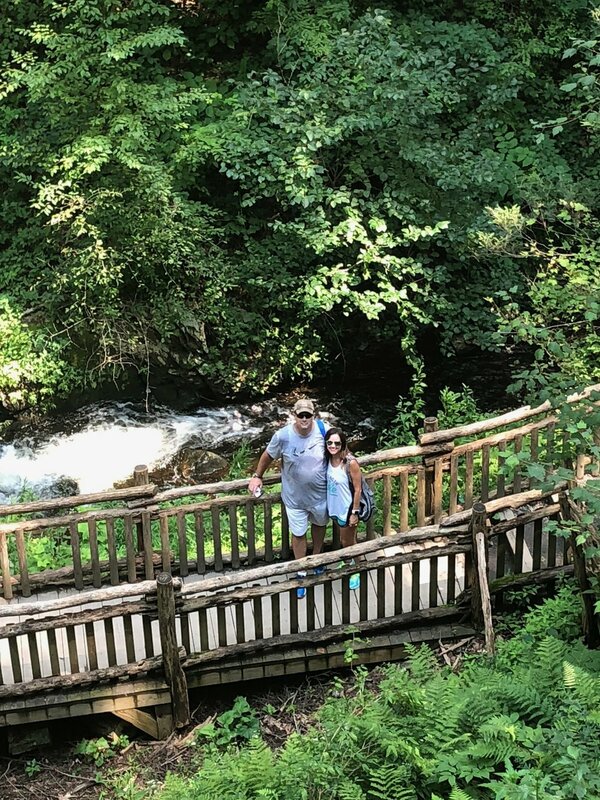 After Bushkill Falls, we decided we hadn’t had enough fun for one day (or activity! Ha!) so we drove to Poconos Treeventures to zipline! We had to go through some training to learn how to properly secure our harness to the lines to zipline to the next station and also when transferring from one line to the next. Mark and I have ziplined before but we have always been where a staff person secured us. 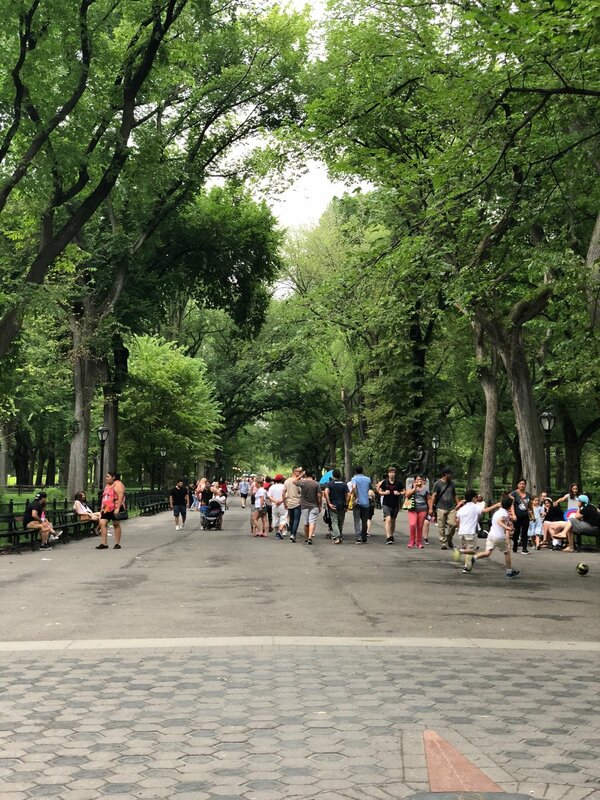 At Treeventures, you are on your own! You zipline through the trees! It took a few stations and then we got the hang of it! The course we chose had 9 ziplines. Shannon and Mark were the only ones who took their phones on the course. Since we were climbing and zipping most of the time, we didn’t take as many pictures! We spent about two hours at Treeventures and after all our hiking that morning too, we were STARVING! It was late afternoon and the girls at the ziplines suggested a diner, Pub 570, down the street for lunch. I had a pulled pork sandwich with sweet potato fries that was HEAVEN! Mark had a philly cheesteak sandwich that was DELICIOUS! We went back to our B&B to shower and change. The guys wanted to check out Mount Airy Casino Resort that was nearby. We hung out there for a couple hours and called it a night. Friday morning, we left the Poconos and shopped our way back to Philadelphia. When I say shopped, I mean SHOPPED! We stopped and shopped clothing, accessories, home decor, and even Christmas decorations! We took our time making the 2 1/2 hour drive. We arrived around 5:30pm, turned in our rental car, and checked into our hotel. We freshened up a little and then called an Uber to take us to Citizens Bank Ballpark! We had tickets to the Phillies vs. Mets game! This is the view from our seats. Mark is a HUGE baseball fan! He played growing up and in high school and even pitched for ACU in college. Visiting all the major league ballparks is on his bucketlist. We checked another one off for him! After the game, there was an Old Dominion concert!! It was perfect weather! They performed for about an hour and then we Ubered back to our hotel to call it a night. We had an early morning train to catch to NEW YORK CITY!! Come back tomorrow for the final Part 4 post of our trip! 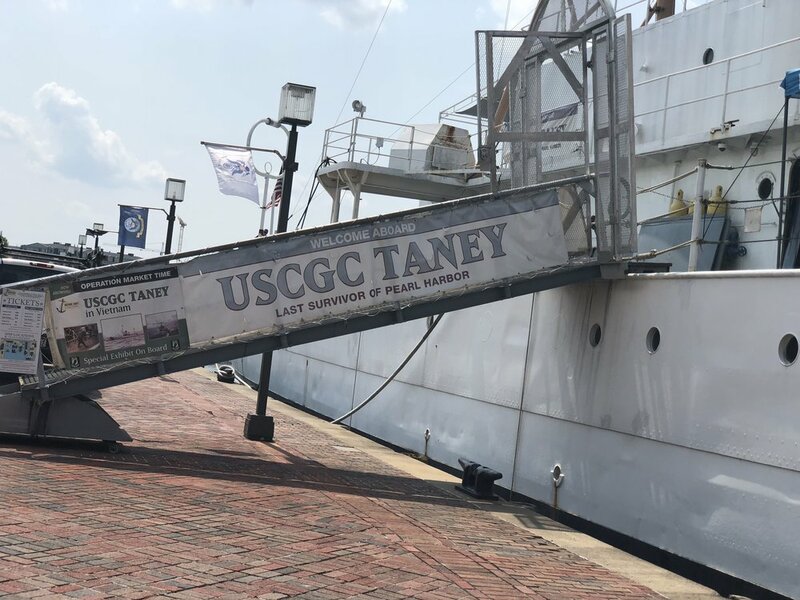 I shared Part 1 of our East Coast Adventure trip on Tuesday. If you missed it, you can read that post HERE. Day 2 started with us waking up bright and early in NJ and driving 2 1/2 hours to Baltimore, MD for lunch! We arrived late morning and walked around the Harbor. It was beautiful weather! The Harbor area is so pretty. There were a lot of stores and shops in the area too. We decided to try Phillips Crab Deck for lunch. It was a cute little restaurant on the water. THE BEST Lobster roll I have ever eaten! See my smile?! My mouth is watering just looking at this picture! SO GOOD! We checked out the ships and more of the Harbor after lunch. And we came across Barnes and Noble! Gosh, I love a good book store! I’m the nerd that loves the smell of the books and coffee and I can wander through just browsing for hours! 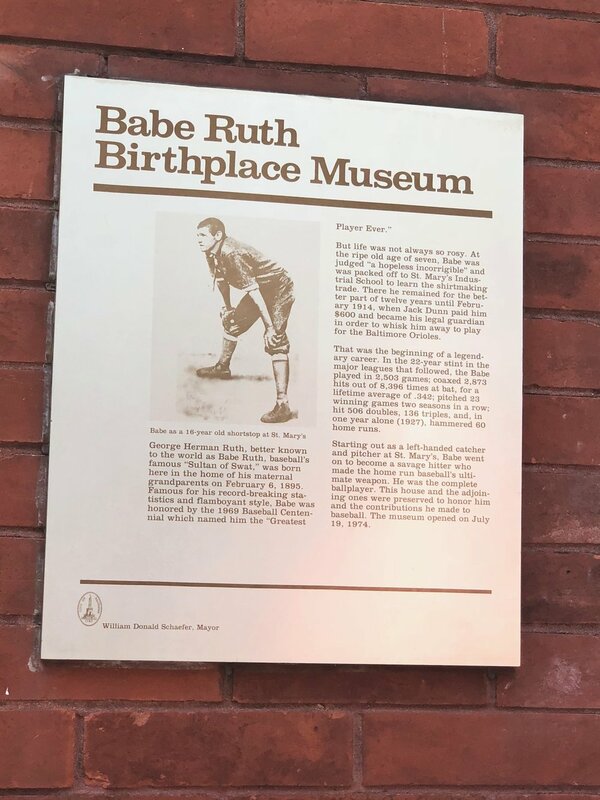 We left the Harbor area and went to see Babe Ruth’s birthplace! 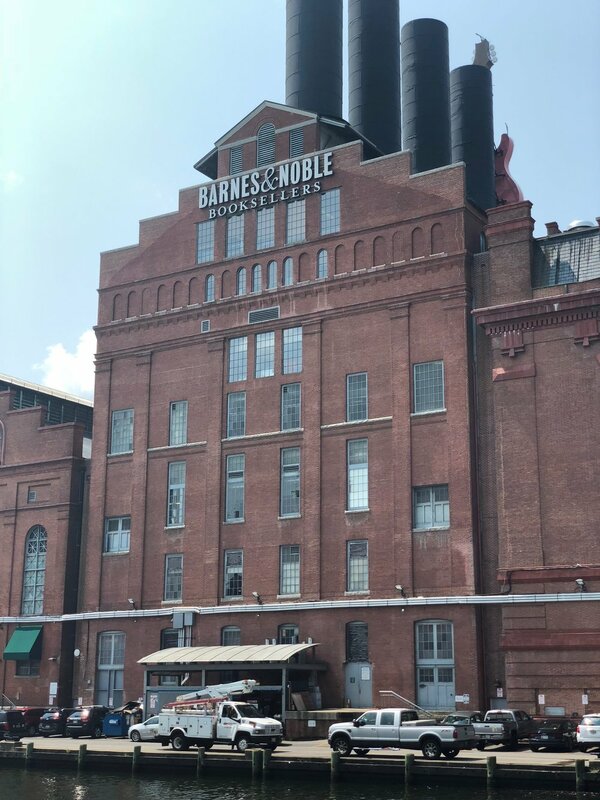 This was one of the things on Mark’s list he really wanted to see while in Baltimore. Our schedule didn’t allow for us to tour the museum. We had more places to go! But it was fun seeing the quaint little street and area. 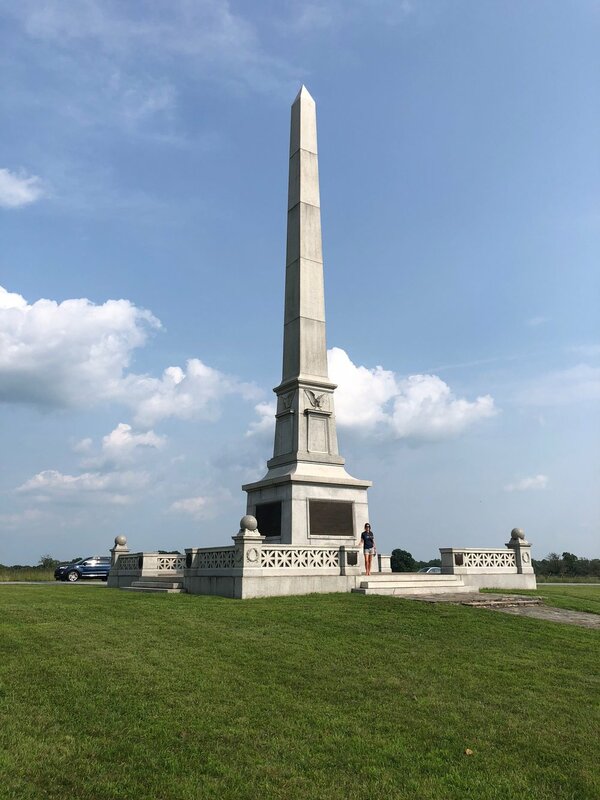 Back in the car and we drove a little over an hour to Gettysburg, PA.
My brother-in-law, Shannon, is a huge history buff! We were all excited to see the battlefield but Shannon was definitely the MOST excited! You can walk the battlefield or there is a driving tour as well. We didn’t have a lot of time so the lady that assisted us recommended for us to walk to this specific lookout point and then back to the visitors center. However, I would definitely recommend doing the driving tour. You can go at your own pace and still get out and walk around any time you’d like. I think you would see so much more that way. Fortunately, the weather was nice and we enjoyed walking and being out of the car for a while. We stopped at several monuments throughout the battlefield. Shannon and Karen! Aren’t they cute?! We have so much fun traveling with them! Such a blessing when your family is also some of your best friends! We made it to the lookout point and the views were breathtaking! I could have spent hours here. 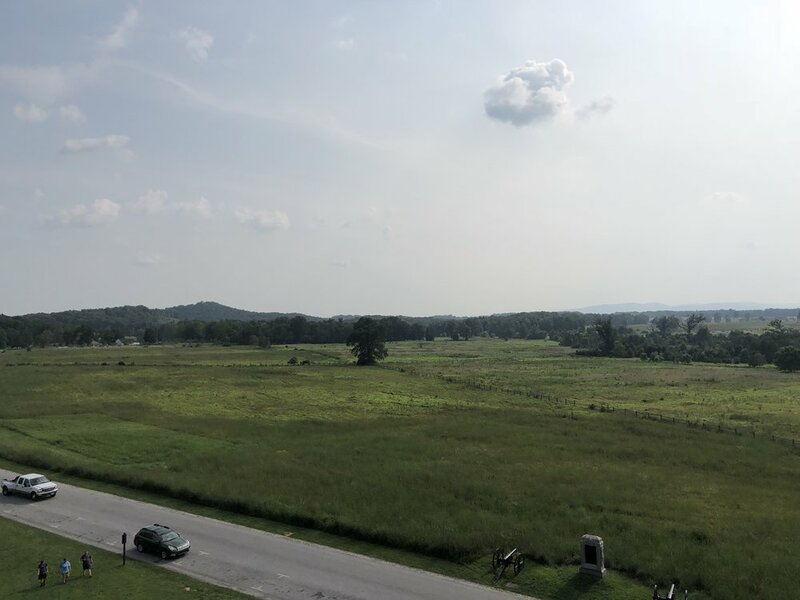 There was so much to see and it was so interesting to read all the facts about the soldiers and the Battle of Gettysburg. On the road again….this time we made the hour drive to Harrisburg, PA where we had purchased tickets to tour The National Civil War Museum. There is a place for each state showing how many people served and how many lost their life. 92,012 people served from Texas and 3,990 died in the war. Most areas of the museum didn’t allow photos to be taken inside. It was a very humbling experience to read about all the battles, soldiers, and generals of the war. So interesting to learn about the guns and different types of ammunition used as well. We also were able to see many original personal items of the soldiers which I find fascinating - toothbrushes, shaving kits, shoes, uniforms, journals, etc. It was around 7:00pm when we left the museum. We had a two hour drive to East Stroudsburg, PA where we were staying the next two nights! A quick stop at Cracker Barrel for dinner along the way and we arrived around 10:00pm. We unloaded our luggage and checked into our B&B and were fast asleep after another long day! The next two days were spent….in the Poconos!! Look for that post next week! See you tomorrow for Friday Favorites! Today I am sharing about our East Coast Adventure trip! I haven’t had a chance to blog about some of our trips over the summer so I’m doing some catching up because I definitely want to be able to look back on these trips! In August, Mark and I went with his sister, Karen, and her husband, Shannon, to the east coast. We had all travelled together back in February and due to an unexpected last minute cancellation of a flight, we had free vouchers for a future flight. 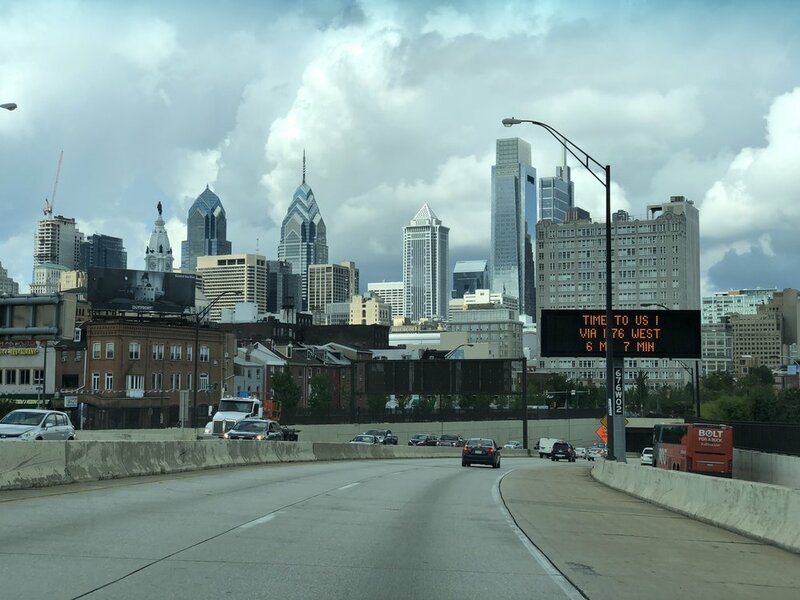 We decided in May that we hadn’t been to the east coast and there were flights into Philadelphia and so we planned our trip from there! Originally, we were scheduled to arrive in Philadelphia around 2:00pm on Tuesday. However, we had to change flights. Long story short - we ended up catching a 5:00am flight and arrived in Philadelphia (after only 1 1/2 hrs of sleep!) around 9:30am. This meant we had more time in the city than we had planned so we took FULL advantage and spent the day in Philly! We loaded up in our rental car and headed out to explore the city! 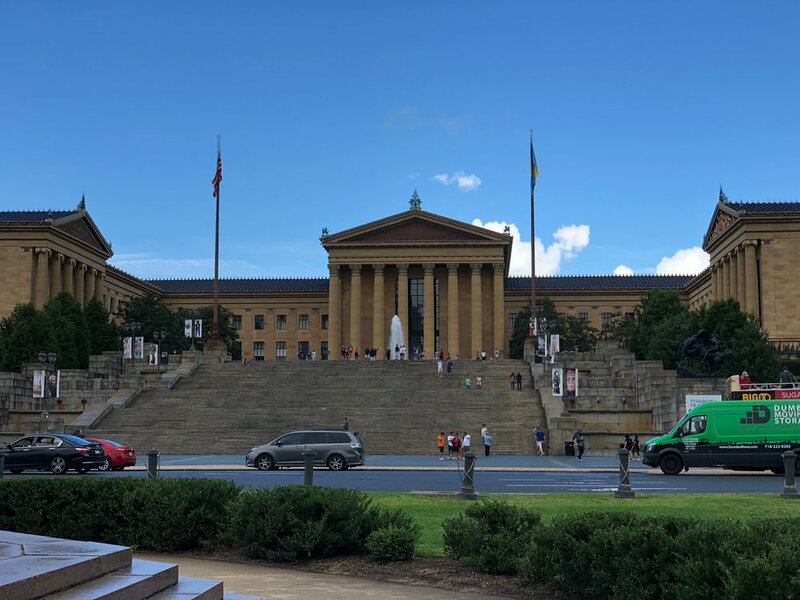 First stop, was the Philadelphia Museum of Art. Do those steps look familiar?! It’s where they filmed the famous Rocky scene! Everyone was taking pics with the statue but we decided the line was too long. Mark snapped this pic before the next person walked up. Ha! Even the girls made it! We explored the park across the street for a few minutes. 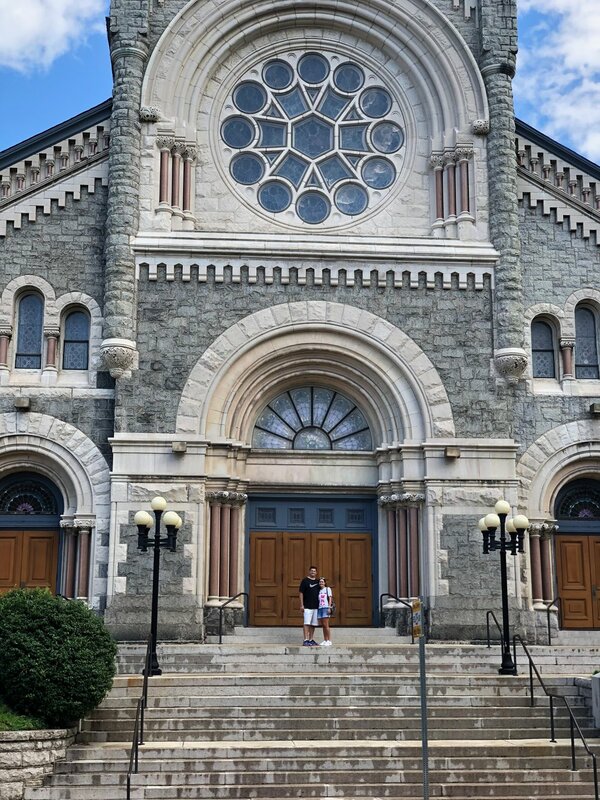 We saw this beautiful church and decided to take a closer look. It was stunning! Truly breathtaking. And on the cutest little street! And let me tell you, it DID NOT disappoint! We stumbled upon the VERY FIRST Post Office! For those of you who don’t know, Mark is the Postmaster of a small town, Stamford, TX, that is about 40 miles from where we live. His father is retired from the Post Office and so this was extra special for him to experience! It was the cutest little building and still had the original hardwood floors! We went to a shop a few doors down and purchased postcards to send to the kids! 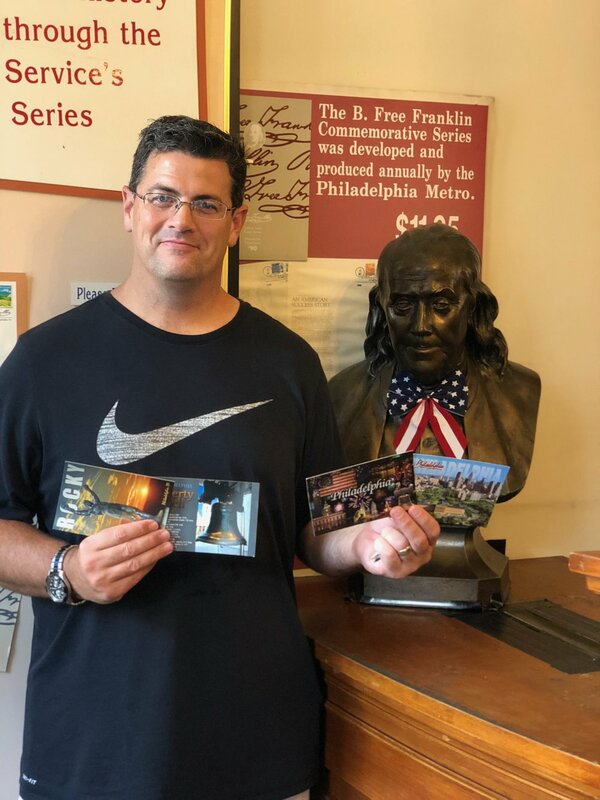 Mail from the Ben Franklin Post Office was a hit back home! When in Philadelphia, you must eat a Philly Cheesesteak! We popped into Sonny’s for lunch and it was delicious! *Please note it started raining on us when reenacting our Rocky so that’s my post rained on look! Ha! We came across Betty Ross’ house! So much history packed into just a few blocks! 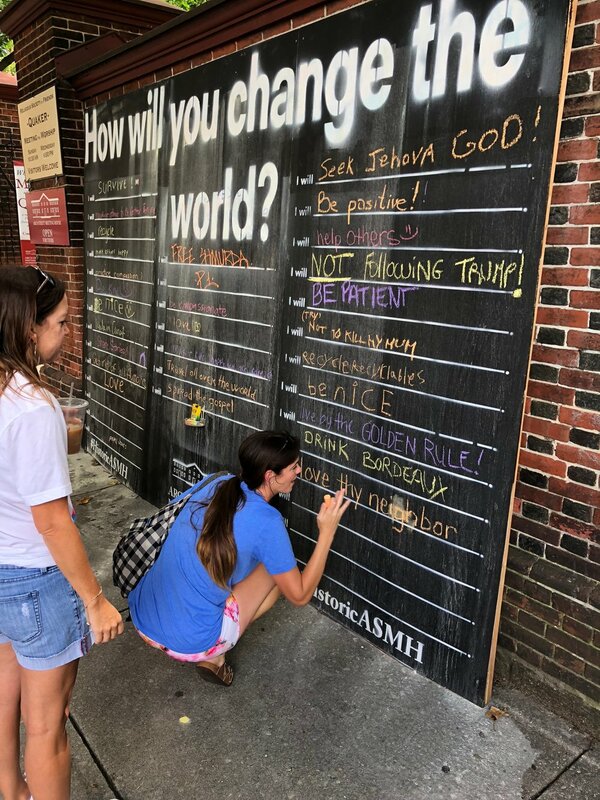 We walked by this wall and Karen added our answer to “How Will You Change This World?” - Love thy neighbor! We toured the Declaration House where Thomas Jefferson wrote the Declaration of Independence. We were able to see the rooms where Thomas Jefferson drafted the Declaration of Independence. They are recreated to show what they may have looked like at the time. Next, we set out to find Ben Franklin’s grave. His grave is in an old cemetery downtown. People throw pennies on the grave and make a wish. It started POURING down rain and so we waited it out for a while in the subway. This is us once again soaked! We finished our day in Philly with the Liberty Bell! We absolutely LOVED our time in Philadelphia! We were able to do so much more than we originally planned and it ended up being one of our favorite days of the trip! We piled our wet selves back into our rental car and drove 1 1/2 hours to Atlantic City, NJ! We checked into our hotel, changed into dry clothes, and headed to check out The Boardwalk! We took in the sights, ate a delicious Italian dinner, and then called it a night! Remember, we had an hour and a half of sleep before catching a 5:00am flight. We were exhausted! Come back tomorrow for What’s Up Wednesday and then Part 2 of our East Coast Adventure on Thursday’s blog post!